I’ve decided to take on the NaNoWriMo challenge this years. For anyone who has no idea what this means, NaNoWriMo refers to “National Novel Writing Month” — for the last several years, novelist wannabes around the country (and even across the planet) have taken up the challenge to complete a 50,000 word novel in just one month, November. A number of now-published (several of them quite successful) novelists got at least one of their novels started this way. The idea is that it makes all those people who say “I’m going to write a novel someday” put themselves to the test. The time pressure of producing a 50,000 word draft in just 30 days is supposed help them stay motivated. 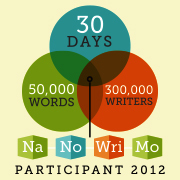 Participants can also register on the official NaNoWriMo web site, to be held to some accountability, to get encouragement from fellow participants, to use the web site’s word counter to check their progress, and to claim their kudos if they make it to 50,000 words by the end of the month. Even for a short draft, cranking out 50K verborum in a single month is a lot of writing — almost 1,700 words per day, if you write every day. Not too big a deal if you have absolutely nothing else to do with your working hours, perhaps, but how many of us are in that situation? Anyway, I’m going to give it a go. So, what am I going to write? Well, I want to something that might actually get read, so I need to pick a fairly popular genre; these days, readers like to know that a new author has more in the pipeline (one-offs don’t satisfy voracious readers), so it needs to be something that can be first of a series. But it also has to be something that I want to write, which narrows the field considerably. And I have to decide by tomorrow (the whole NaNoWriMo business just occurred to me yesterday). As it happens, I have a story in mind — something that I’ve been making up in my head for more than 30 years, although I had never seriously thought about turning it into novels. Still, this strikes me as the opportune moment to get started on what is potentially a long string of connected novels. I won’t reveal just yet what it all about, but the working title is “A Green and Pleasant Land Among the Stars.” I’ll let you know how it goes.